Focusing on menswear only, Donatella Versace brought a Pre-Fall 2019 into a next level with great products, high quality and enjoyable details. When you’re doing a runway show, you needs to edit in terms of ideas. 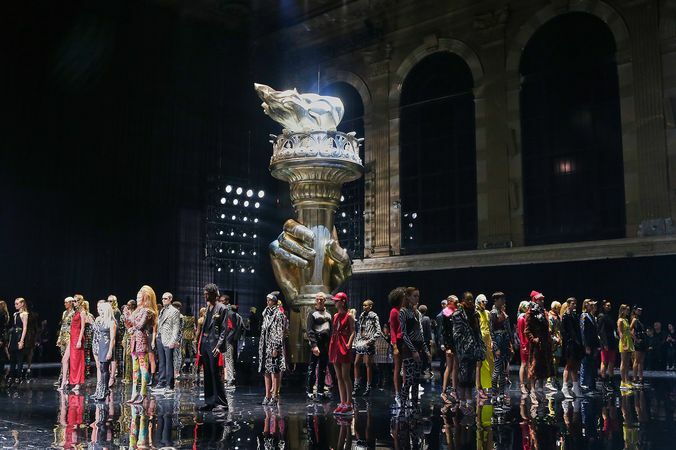 Donatella needs to change the creative process if she is entering the runway frenzy for every show. She took Pre-fall 2019 into next level, combining Gianni Versace from mid’s 90’s to Donatella mid’s 2000’s. For the menswear, we talk about stars, stripes, and barocco, pulling out patterns from 1996, some from 2003 and so on. The show held at American Stock Exchange Building in New York City, attending the special guests, VIP’s and front row celebrities. Teyana Taylor, model Sara Sampaio, Crystal Tianai, rapper 21savage, Mary J. Blidge, model Winnie Harlow, Paris Jackson, singer Ciara and Uma Thurman among others. The kicks are back in the Pre-Fall 2019 by Donatella Versace, printed with Savage Barocco pulling out and highlight one of the best. The Chain Reaction, a sneaker that embodies the strongest elements of the Versace identity. Eclectic details create a one-of-a-kind shoe characterized by a lightweight, chain-linked rubber sole that takes inspiration from iconic Versace chain jewelry. Signature elements on the newest Versace sneaker include the iconic Greek Key pattern, the ‘Chain Reaction’ logo patch and braille ‘love’ lettering expressing the concept that love is blind. Versace arrives in New York for the firs time, taking the City by storm with its instantly recognizable style and unmissable personality. An explosion of prints that celebrate Versace’s Italian roots – zebra, stripes and. stars intertwined with Greca and gold Barocco elements. Heart on his sleeve – the printed and embroidered ‘Love Versace’ total look from the Versace Pre-Fall 2019 fashion show. Bright colors inspired by the vibrancy of New York – on vinyl dresses with cut-outs, caps, bags and matching Versace Chain Reaction sneakers.